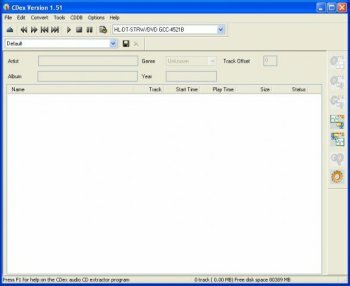 CDex is an application which is able to record audio tracks from a CD-ROM, and save those files to disk in a standard WAV file. CDex can extract the data directly from an Audio CD, which is generally a called an Audio CD Ripper or CDDA utility. It reads the digital audio data directly from the disc, which can be stored in either a WAV file or a MP3 sound file. What happeded to this program? Why author does not react? I logged on to post a review that it turns out is exactly the same as that which Targaff has so eloquently already posted. I also was disgusted with the malware/adware that the developer has loaded his supposed "OpenSource" software installer with. I am also saddened by it. I usually look to opensource software as a good way to stay away from spyware, but having encountered this a couple of times lately, with CDBurnerXP and now CDex, I think there has to be a better way. I also acknowledge that developers SHOULD be paid for their work if their work is of value, and the free market is the best way to determine that value. I would prefer a payment model a little more like Google has created with their app store where a somewhat stripped down version of the app is usually free, and if you like it, you pay a few bucks for it to have the nagware removed. I say "a little" because a lot of the apps on the google store are loaded with adWare which, as stated above, I loath and think it absolutely the wrong way to go. I prefer TrialWare or a stripped down version that's free and pay to unlock the full version. I have turned away from buying many an app on the google play store because the adWare is so tiresome. I don't see that any of this crap was present in the previous version. While I sympathise with the need for developers to obtain funding, going down the malware route is a guaranteed way to lose all of the good will that has built up, especially when, as previous posters have pointed out, there are perfectly good alternatives that haven't resorted to such tactics. If anything, a 1-star rating is generous for an installer that's as plague-ridden as this one. Nice to see that development has started again on this best-of-class program. I have been using this program for a couple of years. It works well, and is very reliable. And it's FREE. With NO adware or spyware. This is one of those absolute must have programs. It's a gem, plain and simple. A bit spartan interface but it works smooth and no one should complain about it. I would never use this but wanted to check it out for comparison. Seriously guys, lose the "hybrid installer"...it's ridiculous. Binaries are just fine thanks. Get it done, get it out.